BMW, Mercedes and Audi are the German Big Three. They have dominated the premium car scene for decades and are all now creeping into other sectors, compounding their positions. But two contenders are emerging, both of which have flourished under their current owners but were dulled under Ford ownership and under-financed before that. Jaguar and Volvo were part of Ford's Premier Automotive Group, a disastrous affair that introduced boring design and Ford components into the formerly skint but well loved companies. In 2008 Ford sold Jaguar and Land Rover to India's Tata Motors and in 2010 sold Volvo to China's Geely. Both Tata and Geely have deep pockets and have allowed Volvo and Jaguar to develop new models, and new tech. Without Ford's corporate interference the two are re-emerging with their old identities intact, and with great new cars. At their core they are all premium brands with a reputation for reliability and luxury. They all have a Unique Selling Point. With BMW it is a rear wheel drive sporty chassis, with Audi it is four wheel drive and with Mercedes it is luxury. They have all developed an in-house tuner with a legendary name: AMG, quattro, M Division. They all have an iconic car: S-Class, Sport Quattro, M3. They have have huge selling core models: 3-series, C-Class: A4. They all produce a wide range of engines in a wide range of models cars from an economical diesel to a range topping powerhouse. They all indulge in niche busting models, which annoy purists but sell loads in India, China, Russia and the US. They all produce four wheel drive versions of their mainstream cars. They are all successfully building smaller and bigger cars. They all have low depreciation which aids private sales (90% of Mercedes' UK private sales are purchased via finance. They all produce core saloon cars and build variants of those models: estate, convertible, hatchback, coupe. They are all thought of as German but build up to 50% of their cars abroad to keep costs down and inveigle themselves in local markets. Their dealers have first class reputations for service (and high cost). They are all considered cool, aspirational cars from all age ranges. Motosport: Audi at Le Mans, Mercedes in F1, BMW in sports cars. All achieve in motorsport with the associated brand imagery. Having said all of that each of the German Big Three has a weakness or two. Mercedes has suffered reliability and quality problems over the years, BMW's interiors are too conservative and larger Audis still understeer because the engine is too far forwards in the car. Premium brand: Jaguar are a premium brand already and Volvo is on its way to being so. Its new cars are a step above the Opels and Fords of this world but are not quite up there with Jaguar. Having said that Audi started from a low position and moved its way up. USP: Jaguar's Britishness and roaring saloons, Volvo's class leading safety. In-house tuner: Jaguar's R-S division is making a name for itself. Volvo is quietly developing Polestar as a brand in itself and will take it world wide in a couple of years. Iconic car: E-type translates into F-type. Volvo has been less successful in this regard. It's history is safe, boxy estates whilst its present is something slightly different. The V60 Polestar could change this. Halo car: Jaguar has two with the XKR-S and XFR-S but the cancelled C-X75 could have been much more. Volvo doesn't have a Halo car at the moment but the P1800 concept could be that at some point. SUV: Jaguar will have one in a few years. Volvo has the ageing XC90 and the XC60. Both will be replaced but the new XC90 will be first and is promised to contain all the new tech, and could be a massive hit. Core models: Volvo's S60/V60 is this car, but doesn't have the A4/C-Class/3-series reputation. It should have, but doesn't. The reason is a lack of wider range and wider brand image. Jaguar doesn't, but will. The XF is too large to sell in vast quantities, but a smaller saloon is on its way. Engine range: Jaguar and Volvo already have a wide range of engines but buy most of them in from, would you believe it, Ford, which restricts outputs. Both are constructing their own factories to build cutting edge engines and increase supply. Niche busting: Neither Volvo or Jaguar has upset anyone with models that sell well but don't lie easily with the brand. Jaguar's SUV will be the first step. Volvo needs to expand its model range. Four wheel drive: Jaguar does this in some markets, but not the UK because it was retro-engineered and doesn't suit RHD models. They need to do so in all markets in future cars. Volvo has a limited four wheel drive range but needs to offer it across more models. Bigger and smaller cars: This is all about depth of range. Volvo has it sussed at the upper end and is working on the lower echelons. Volvo has it in the lower end but the S80 lacks credibility against similar offerings. Low residuals: With reputations rescued from the Ford years Jaguar and Volvo are on upward trajectories. Both have scored well in reliability and customer satisfaction surveys in recent years. Variants on core car: Jaguar's small saloon will also be offered as a sports brake. It also needs a convertible and coupe version. Volvo's S60 also comes as an estate but there is no coupe or convertible in the range. Volvo has experimented with these and needs to introduce variants soon. National identity: Jaguar will build cars in India and China. Volvo plans to build a factory in India. Neither move should hurt Volvo's Swedishness or Jaguar's Britishness. Dealers: Jaguar dealers give more customer satisfaction then any other brand. Volvo's are up there with Mercedes and above BMW and Audi. See the JD Power 2013 Customer Satisfaction Survey results here. Cool and aspirational: Jaguar is considered an aspirational brand amongst older owners but not many youngsters. Volvo lacks in this regard, although it is considered quite cool. Motorsport activity, new models and brand marketing can only help in this regard. Motorsports: Jaguar and Volvo are totally lacking here, although both had a stab at touring cars years ago. They both need high level motorsport programmes. 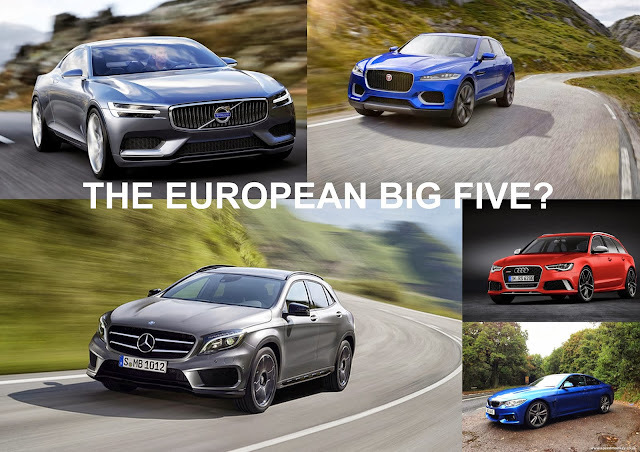 All of the above shows that Volvo and Jaguar are there or thereabouts and need only a few more years before the German Big Three becomes the European Big Five. I have driven cars from all these manufacturers and can absolutely attest that Jaguars and Volvo make cars that handle as well, have better interiors than, have as good tech as, have engine ranges as good as, look as good as and provide as much satisfaction as similar models from the Big German Three.